A battle between former teammates provided an explosive fireworks show worthy of a Fourth of July celebration as Donald Cerrone survived early adversity to knockout Melvin Guillard at 1:16 of the first round. 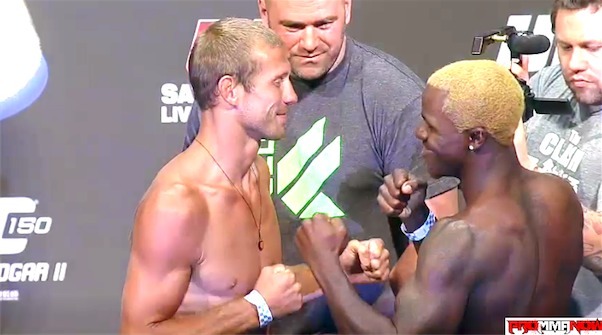 Cerrone came out headhunting, but it was Guillard that struck first, stunning Cerrone with a crushing left hook. Guillard attacked, pouring on a vicious flurry of strikes that included right hands, elbows, and uppercuts. Cerrone wobbled around the octagon looking to survive as Guillard continued look for the finish. Cerrone managed to regain his senses enough to unleash a staggering head kick that stopped Guillard in his tracks. Cerrone saw his opportunity and capitalized, uncorking a right hand that put Guillard out cold on the mat. The stunning KO gives Cerrone his sixth UFC win compared to just a single loss, and improves his overall record to 19-4.